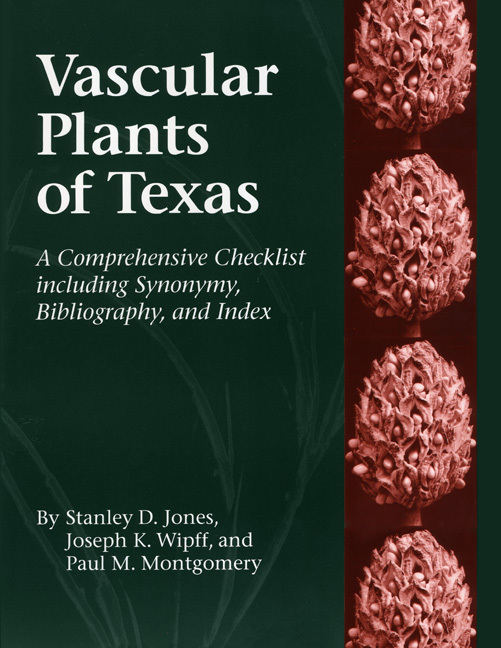 A checklist to all the vascular plants found in Texas, including crops, persistent perennials, and naturalized plants. Everyone with a professional interest in the flora of Texas will welcome this checklist of the vascular plants. This comprehensive list also includes crops, persistent perennials, and naturalized plants and encompasses over 1,000 changes to the previous (Hatch, 1990) checklist. The authors have arranged this checklist phylogenetically by classes following the Cronquist system. Several features make this checklist especially useful. Chief among them is the relative synonymy (name history). An extensive index makes current classification and correct nomenclature readily accessible, while the botanical bibliography is the most extensive ever compiled for Texas. The authors also note which plants have been listed as threatened or endangered by the Texas Organization of Endangered Species, which are designated as Federal Noxious Weeds, and which have been chosen as state tree, flower, fruit, etc. by the Texas Legislature. Stanley D. Jones and Joseph K. Wipff are botanists at the Botanical Research Center in Bryan, Texas. Paul M. Montgomery is a photographer with a special interest and expertise in grasses. His work has appeared in numerous publications.